Denomination : Bronze 8 prutah. Date : dated year 3 (40 BC). Reference : Sear Greek Imperial - 5523. Hendin 486. Size : 22.8 x 24.8 mm. Weight : 6.96 grams. Grade : VF / Fine. 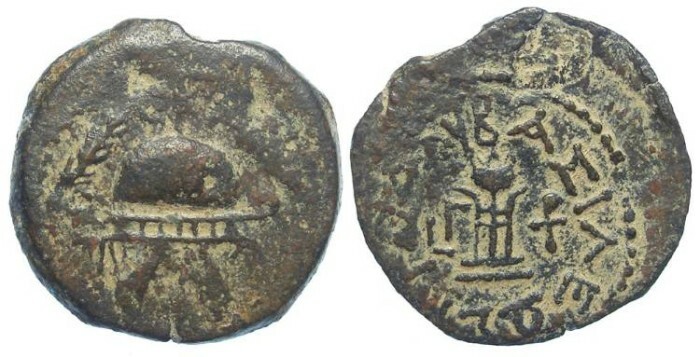 Obverse : Tripod with a Greek inscription around, naming King Herod, with the date mark for year 3 in the field to the left. Reverse : Helmet between two palm branches and surmounted by a star. This is a rather un-attractive specimen of the type, but it is inexpensive.